If you would like to leave a comment click here. 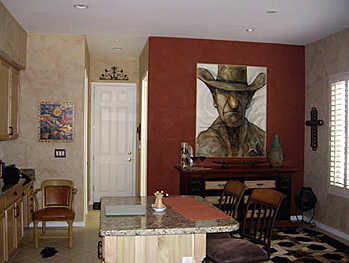 I thought you'd be interested to see where a couple of your wonderful Wild West paintings are hung. We recently saw your T.V. interview with Chrys Peterson. We then stopped by the American Gallery to see your work. I decided to email you some photos when I heard you say your paintings "were like family" & you felt as if people "adopt" them rather than buy them. I just want you to know that we love them & they both hold a place of honor in our Arizona home. Also, Sheriff Clyde Calhoun is now hung just slightly crooked. Because a visitor to our home told us, " in Arizona all Sheriffs are a little crooked ! ! " 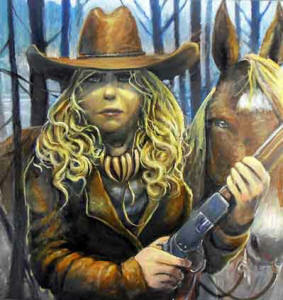 Do you offer any prints of your paintings. 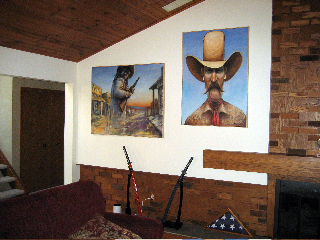 I am looking for prints of western lawmen paintings for some of our headquarters offices. Thanks again for your gracious hospitality yesterday. I hope we did not outstay our welcome too badly. Art aside, you are a truly interesting and nice guy to talk to. Wish I could have met Sally too. I hung Goldilocks in her new home last night and she transforms the room! I knew she would! Bill, my husband, came home from work this morning and was very pleased too. We sat on the couch with the labs (Tucker and Max) and just looked at her for a while. I really do hope that you and Sally will take a ride out and visit one day soon. 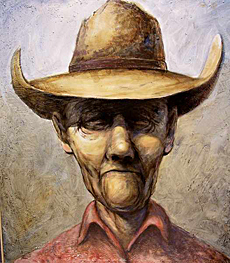 My name is Frank Willis, I have been an admirer of your paintings for several years. I usually visit Toledo a couple of times a year and have had the pleasure of seeing some of your wonderful work hanging in the American Gallery, in Sylvania. I particularly enjoyed your work "That's Far Enough". I should have purchased it when I first saw it, but at the time I didn't have the area to display it and enjoy it. My question is, am I lucky enough to find out it is still available? If it has been sold, do you ever repeat any of your paintings? My name is Jessie Owens and I am A huge fan of your work. I have been in love with your wide-brimmed gentlemen since I was young, walking past the American Art Gallery in Saxon Square to get ice cream after school. Now entering my more formidable years, I am looking to put some color on my walls and purchase my first major artwork. Also let me say that I think "the Kid" that you have presently displayed at American Art is the best yet, though a little too far out of my budget. I'm emailing to ask if you sell your art anywhere other than at American Art Gallery? I'd love to find something I love just as much a "the Kid" or "the Rancher" in my price range and make my first cowboy purchase official! Thank you so much for your time and for your contribution to the art world! I am amazed by your work. I would hope that a non-collector of fine art would stand a chance of affording a piece by you. Your work is so captivating, I so enjoy the colors and colorful characters you showcase. I am anxious to see how much it would cost to purchase a piece by you. 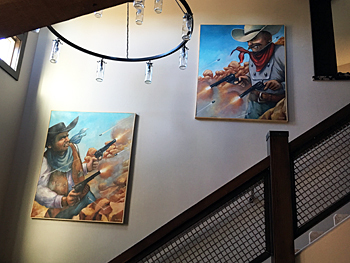 We finally got Stick 'em Up out to our home in Virginia, so I thought I'd pass along a photo of it hanging in our dining room. We absolutely love it! Thanks again and take care. 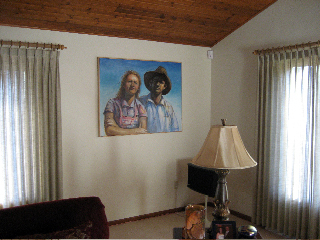 Our recently finished new home turned out great, but when guests take a tour of the house, much of their praise revolves around Dave's art work. 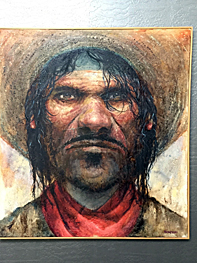 The western characters are done in an authentic style, but they are incredibly unique. 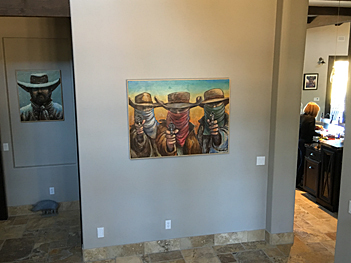 We've been to countless art galleries in the Southwest, but still have seen nothing that rivals the personality that flows out of each painting! I own four of Dave's fantastic paintings, my only problem as I told Dave earlier, is that I no longer have any wall space for another. Who am I kidding, I'll make room!! Thinking of you and wishing you all the best in the upcoming voyages! We absolutely love Dave Wisniewki's work. 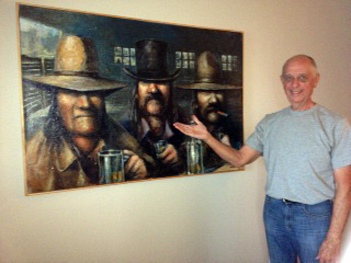 We have three of his paintings and enjoy the stories behind the artwork. 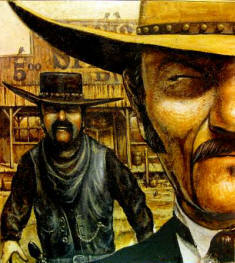 Tequila Pete and Ten Bear are larger than life characters. We love having these conversation pieces in our home. Dave I truly love your paintings. 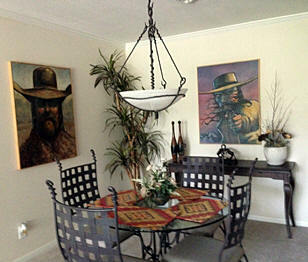 My wife and I are looking at a home in Lambertville, MI and the owner had three of your paintings. 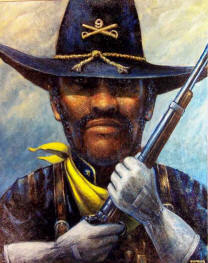 (Tequila Pete, 10 Bears and Buffalo Soilder) I was so intrigued by Tequila Pete that I set out to find the artist. I would love to see more of your art if you could point me in the right direction. Really want to see Adios if it is still available. Thaks Dave and keep on doing what you are doing. It's great! I was researching The James Brothers as my husband is in the genealogy of Cole Younger. I came across your webpage and your work is excellent. I myself am Creek Indian, though 50% polish with family names of Stafanski, Witkiewicz, and Pietrovszki all from Poland and then settling still today in Ohio. I am in California and would love an art piece, though too many amazing ones to choose from. I love the details, colors, and projection of the art work. The pictures are absolutely captivating. 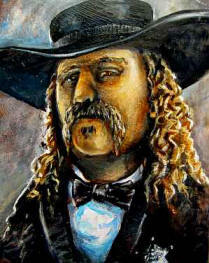 Have you ever painted a Cole Younger? Also, do you paint the different tribe types such as Creek? I clicked through the gallery and am also wanting to know how to determine prices? I just got my UT alumni magazine and saw your article. I'm a 2002 Business grad. I would love to know how much some of your available art is going for. 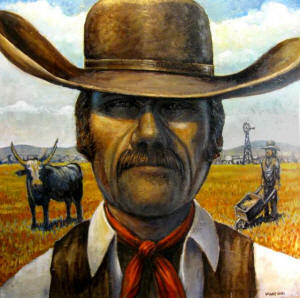 If I could afford it, I'd love to get one of your western paintings. I live in Toledo. My husband and I have recently moved to Texas from Illinois. We retired closer to family. 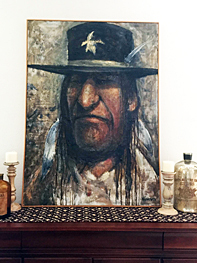 My husband has been fascinated with the Larry McMurtry novels now that we live "Out West"and we have both become fascinated with southwestern art, cowboy and indian images mostly. 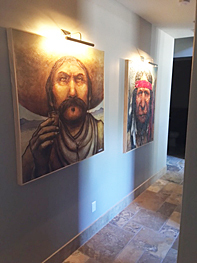 We recently traveled to Sante Fe and purchased some posters showcasing indian characters. 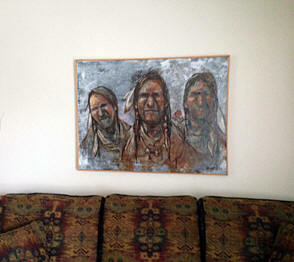 I really think your paintings would do well in Sante Fe. I can't say that I saw anything similar to your work there. We came home and have continued to look for some special, but would not call ourselves serious collectors. 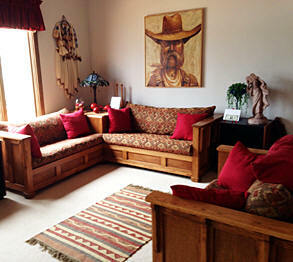 We live in Denton Texas and like the idea of bringing a little of the southwest into our home. We really do love your work. I especially like the vibrant colors you use and the cartoonish style of the images. All your subjects look as though they would have great stories to tell. Right now I am drawn especially to Crooked Crow, but I do love others as well. I don't know if all your paintings are on your website? If so, I will continue to admire them and see if I can squeeze some $$$$ out of something, somewhere, somehow. Thank you for responding to my request. You certainly are very talented and I have enjoyed reading your story. I have a great mom too. She moved with us from Illinois and now shares our home with us in Texas. Dave these are absolutely beautiful and so real, my favorites are the three indians and bart bashaw waits, keep up the good work. "Dave, I am still really in awe of your talent. 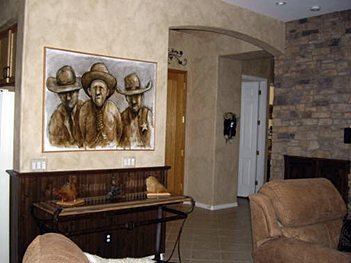 I really enjoy looking at your paintings on your website. You truly are a gifted artist."